Nottinghamshire should be justly proud of its role in reviving a colourful custom; the plough Monday play, a type of mummer’s or folk play. This was undertaken by plough workers commonly called Plough boys or bullocks. January was of course an important time of year for the agricultural and ploughing resumed for the new year in January. However, across mainly the eastern counties of England, those associated with arable farming, took the first Monday after Twelfth night called Plough Monday, as quasi-official day off. 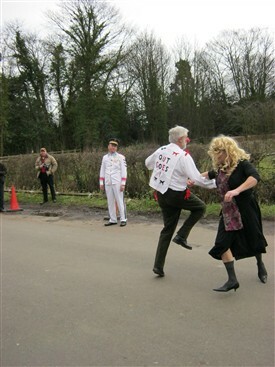 Different activities were associated with the day: East Anglia, Cambridgeshire had its Molly Dancers and in some cases their strawbear (as resurrected in Whittlesea (revived 1980) and Ramsey (revived 2009) whereas Lincolnshire, Nottinghamshire, Rutland and Leicestershire had the Plough Bullockers and their play. As stated these groups variously were called Plough or Bull Bullocks or Guysers (the later referring to the guiser or guyser deriving from dis-guise identifying the general blackening of their faces and fancy costume). 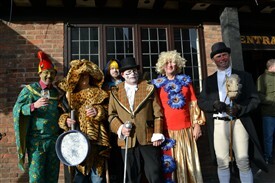 Millington (2002) has recently reclassified the mummer’s play into Quack Doctor and within these sub groups Recruiting sergeant and Hero combat plays and in the county both types were encountered: a Recruiting Sergeant Quack doctor play was the most widespread mainly found in the eastern half of Nottinghamshire, but in a small region, north of Mansfield and south to Kimberley and along the Derbyshire border (but usually Christmas time), the Hero combat Quack Doctor was encountered. What role the Hobby Horse had is unclear although of course a similar creature was present in the Owd Oss tradition . The Quack Doctor Recruiting sergeant is the most complex and for more details the reader is recommended reading the works by Millington. Basically it involves the Recruiting Sergeant persuading the Farmer’s Man to desert his Lady Bright and Gay and enlist in the army. The Lady then takes up an offer of marriage from Tom Fool. Dame Jane enters with an illegitimate baby, which she tries to dump on Tom Fool. At this points Beelzebub, Eezum Squeezum or Threshing Blade, or some other character comes in and knocks Dame Jane, and then the Doctor is called in to perform comical diagnoses and cures. In some cases other characters are introduced such as the Ribboner, Sanky although they do not add much to the narrative. It is tempting to think that the longer play was the original, but I feel it is probable that the play got extended as the ploughing community expanded and more people wanted to get involved. 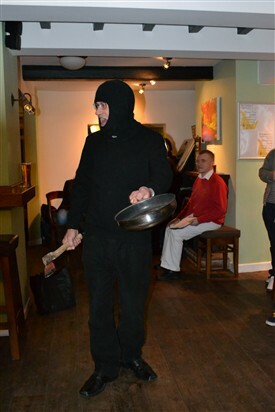 This can still be seen in the revivals such as the CRAPPPS Calverton play which in 2013 brought in or resurrected a new character bringing the group to a sizeable 11! This in itself made the play slightly more incomprehensible and consequently more esoteric due to its rambling nature and as Millington notes a parade of characters. Quack Doctor Hero-combat has St./King George have a swordfight with an adversary, often called Slasher, his father or mother, a ‘man-woman’ calls for the Doctor is brought in to cure the loser. Sometimes a police man would be brought in. Both plays ended in a song emphasising the need for money which would be collected often in the pan of Beelzebub. The loss of the Plough? In many cases without sufficient recompense they would use this plough to plough up the gardens of those not donating money! The oldest references appear to be legal such as Sir John Markham of Rufford, prohibiting observances in the 1500s and most interesting a court case of North Muskham when some men were arraigned before the ecclesiastical court in 1596-97 for having ploughed up the church yard on “Plowe Daie” and abusing the vicar. They apparently appeared in court in costume, and the judge ordered them to turn back the furrows they had ploughed. Neither reference suggest plays, as claimed about the later by the present Muskham Pinkies, but does indicate the long history of the begging tradition at least. Such activities as the author states were probably a survival little more than in name, but such activities are still undertaken, albeit a revival in Hinckley Leicestershire on Plough Saturday. With a subtext of death and resurrection, this view is tempting some such as Brody (1969) and Ridden (1974) stressed an ancient and possibly pre-Christian origin of the play and the celebration. Needham (1936) drew a relationship between the geographical location, the north east and Dane Law. 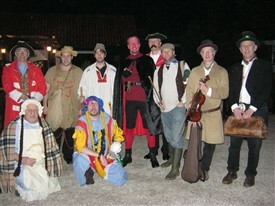 Others have highlighted the wooing aspect and drawn parallels with classical plays such as the 16th century Satyre of the Thrie Estasis.However, the simple fact that there is neither any record of plough plays before the 18th century nor any agreed pre-cursor plays has raised doubts to their ancient origins and no such plays exist in Denmark. Although it is possible that the plays hold some ancient message, it is equally probable that the plays arose in the 18th century if the 16th century reference from Muskham does not suggest a play. Indeed, the earliest account of such a mummers play is from nearby Reversby, Lincolnshire from 1779 by Morrice dancers and although undertaken at Christmas it is a plough Monday play. Certainly the plays have all the aspects beloved of the bawdy and raucous: the transvestite and their advances upon the young man, the boasting, the fighting, the fear of conscription and perils of a run in with an encounter with death or unwanted pregnancy..... Surely these components could equally arise at a student Rag event. Indeed, any place where young (often drunken) men want to shock and boast, such as the bragging plough boys. I feel that the begging tradition with the plough evolved in medieval times, and perhaps realising that simply begging and threatening did not work or that a performance earned more money the play begun. From the late Mrs Richardson, brought up at Carlton, Headmistress of neighbouring Camblesforth school notes in NWI . 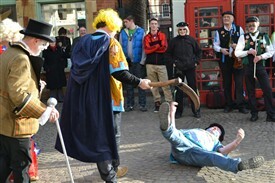 The rebirth of the Plough play can be seen to be solely an act in preserving the heritage of the custom for its own sake. 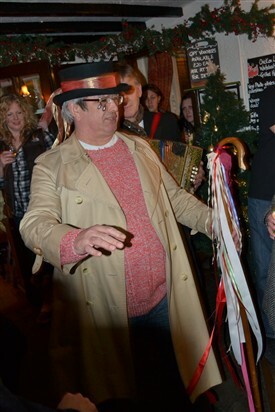 In many cases, the rebirth of the Morris dancer has been pivotal in this, in others like minded preservationists, keen to see all traditions upheld have had a role and in some cases possibly a neo-pagan aspect has been involved keen to emphasize the death and resurrection aspects (certainly this appears the view of the Mushkam Pinkies who stated once it is a celebration of Mother earth). Often these attitudes are found in both camps. Presently there are seven revived performances: Calverton Plough Play (since 1978). The Foresters (1980s? Possibly before), Tollerton Plough Play (2002), The Dolphin Plough Play (2009) and Rattlejag Morris and Sullivan Sword Plough Play (since 2003? ), Mushkam Pinkies (since 2000) and Clayworth Plough Plays (1982). 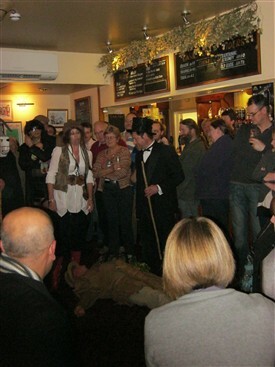 The oldest revived play being that done by either the Foresters (they certainly were the first to revive it in the 1960s) or at Calverton by the Calverton Real Ale and Plough Play Preservation Society (CRAPPPS) are amalgamations of scraps of the local such as the Cropwell version and other plays such as Staunton, Lincolnshire, with natural evolution and asides over time. 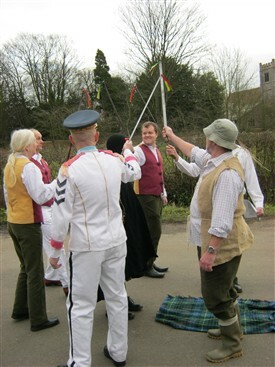 Most of these performances are done by Morris teams (Dolphin, Bleasby and Forresters), whereas that of both Calverton, Muskham Pinkies and Tollerton are plough only groups or local theatre groups. Tollerton, revived after a break of 50 years, is firmly a community based project fully supported by that community. It is perhaps the closest in tradition to the original, visiting local houses and enacted by local people for their community (some of whom may have had farming connections). Collections when made are done for charities rather than for the performers and interestingly none of these recently at least are agricultural or rural based. That done by the Muskham Pinkies lack the illegitimate child scene and the ‘death’ caused by Threshing blade and the devil is Eezum Squeezum. It is based on that given to them by a Mr. Bill Gascoyne of North Mushkam in 1957. It also worth noting, the Ripley Morris’s rendition of the Hero-combat play in the Selston area however although this is a long lived revival, since 1983, it is enacted before Christmas and not Plough Monday. Fisher, J. R. (1960) Memories of a villager Nottinghamshire Archives collection 12th March 1960. Preston, M. J., and Smith, P., (1999) A petygee of the Plough boys or modes dance songs. Sheffield National Centre for English Cultural tradition. F.M.E.W (1923) Plough Bullocks at Bulwell Nottinghamshire Guardian 26th January. This page was added by R B Parish on 26/03/2013. Hi Just wondered why this article comes under Radcliffe on Trent? My mother lived in Caunton around 1900 and could remember a few bits of the play. I remember "In comes I, ole Eazum Sueezum, in my hand I carry a besom, on my head a frying pan, don't you think I'm a fine old man?" She was one of the Boddy family from Hill House Farm. The script that I was given for the Tollerton plough play was actually written down from the 1952 performance.